Human desires are endless and incapable of coexisting with nature. Crying in agony, nature seems to fight back with worldwide natural disasters. Deforestation is one of the worse crimes on nature and also one of the main causes of natural disasters. Now it is the time to change, to stop exploiting nature and find equilibrium. 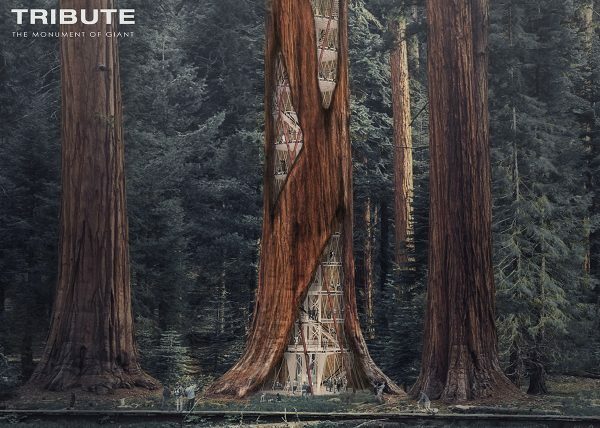 The Giant Sequoia in the United States, worshipped by the Native Americans, has been mercilessly destroyed by modernization. Global warming has increased the breeding rate of pests and has shortened the life span of these trees. Moreover, the Giant Sequoia with enormous volume and height does not grow deep roots. When the heartwood, or the structural backbone start to rot, they fall dead by its own weight. This project attempts to show a new architectural approach to human coexistence with nature, in harmony with the nature’s temporality. The architecture quietly takes place in the empty void of trunks, without hindering the breathtaking landscape formed by the giants. It then becomes active as an artificial organ to replace the trunks rotten away. Only occupied in the void is the minimal gesture necessary for human occupation. Moscow can’t breathe anymore due to non-stopping traffic jams. The transportation system needs to be improved- radical solutions are needed. The analysis revealed the problem of the underground transportation system is that they lack connection to some metro branches, there are long intervals between trains, and problems with transfers between the stations are frequent. There is also the problem of inability to get from one periphery area to another without passing through the center, that is, the so-called pendulum movement “from the periphery-to the center-to the periphery”. This problem can be solved by the formation of a new transportation system and the emergence of a new type of transport. To solve this problem has been created additional chords to the existing system on which the train will move. This is a string-rail system, located on poles, like a monorail, but is more environmentally friendly, low-cost, allowing to develop more speed and allow to set support poles wide apart. Transportation chords will connect disjoint metro station and highway, at the intersection of which must be located multifunctional transport hub, including not only transferring from one type of transport to another, but also the social and cultural functions which are needed in this area. Also multifunctional object should become a new attraction point in the area. The location of the transport hub has been selected at the Vykhino metro station. This is the busiest station of the Moscow metro, because it is the intersection of railways and subways. Also monotonous types of buildings dominate this area and it does not have its point of attraction. Growing out of the massive stepped foundation the project looks like a needle aiming at a pain point and spreading its healing effect on the destroyed environment. On the ground floor there is a train and metro platform from which people can either leave immediately or go to the other floors of the tower. The platform, on which comes monorail is on the 7th floor. In addition to public transport, transportion hub has mechanical tower parking. Located on the first seven floors of the tower, but also there is a winter garden five floors height, located in the living tower. On the second floor there is a farmer’s market, small trade and cafes, as well as a small public garden in the open air. On the third floor there are sports facilities – swimming pool, climbing wall, outdoor tennis and basketball courts. The fourth and fifth floors are co-working area. The living tower is located above the monorail platform. Tower structure allows having flats across species. For example, there are floors completely given over 1 apartment of 250m2, there are standard floors where there are 3 apartments, in addition, and there are two-level apartments with their own winter garden. Currently known as the worst humanitarian crisis of our time, the on-going Syrian civil war has not only eroded the nation in its entirety but also defaced its cultural identity. Over 11 million people have been displaced in the last five years and 4.8 million refugees have been forced to seek protection in neighboring countries, resulting in a continental scale exodus. What was once a land with a rich history and diverse culture is now a war-torn nation reduced to rubble. In response to the existing ruined city fabric and architecture, ‘The Silver Lining’ concept proposes a radical approach of process driven conversion of post-war debris into a myriad of raw building material. 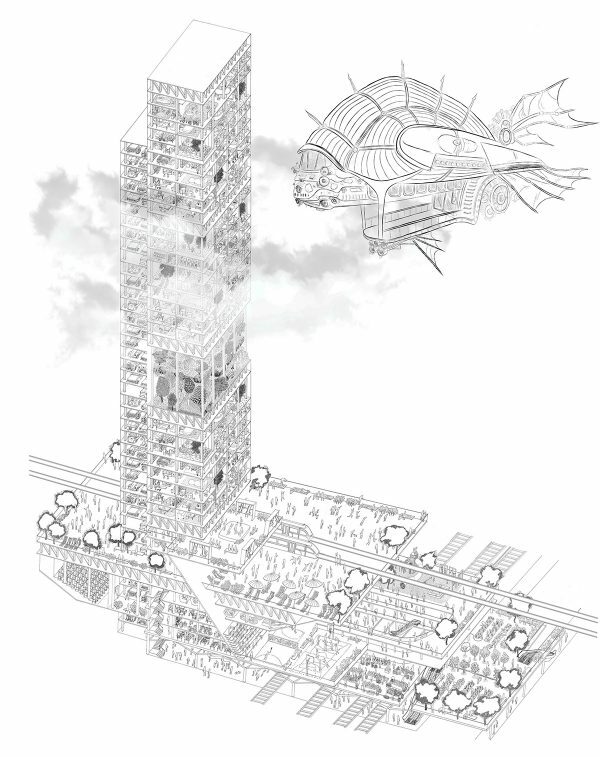 The proposed mega form line establishes a colossal yet sublime presence above the broken city, adjoining the crumbled fabric through extreme horizontality. The proposal extracts the debris from the city into the mega form 200m above ground level and then deposits it under a series of systematic processes from which the reformed material will be placed back onto ground zero for construction. This procedure is distinct and isolated from the post war wreckage; to accentuate the creation of the new city typology from the old. The new city will rise above the debris of war to give the Syrian capital: Damascus a new beginning. The materials used in the building industry and its associated solid wastes account for around half of the wastes generated worldwide. Furthermore, building materials have an environmental impact at every step of the building process; extraction of raw materials, processing, manufacturing, transportation, construction and disposal of material at the end of a building’s life. This project recognizes the immense reserves of building rubble as a result of the war activity and attempts to reprocess it into concrete and distribute it around the affected areas of the city. Current practices of concrete reprocessing involved uncomplicated and well-established crushing techniques which is adopted at a large scale in the proposed mega form. Alongside the debris conversion, the mega form will in conjunction begin to re-establish a natural landscape by the collection and distribution of water and soil beginning from under its footprint. This secondary function is vital in reconstructing the Syrian agricultural industries thus, aiding the economy to become self-sustaining. The landscape footprint will gradually increase creating a public park for the people of Syria to use for daily activities, agriculture and extract additional building materials. The primary purpose of the mega form will be complete once the convertible material has been depleted and recycled into usable building material for the city. 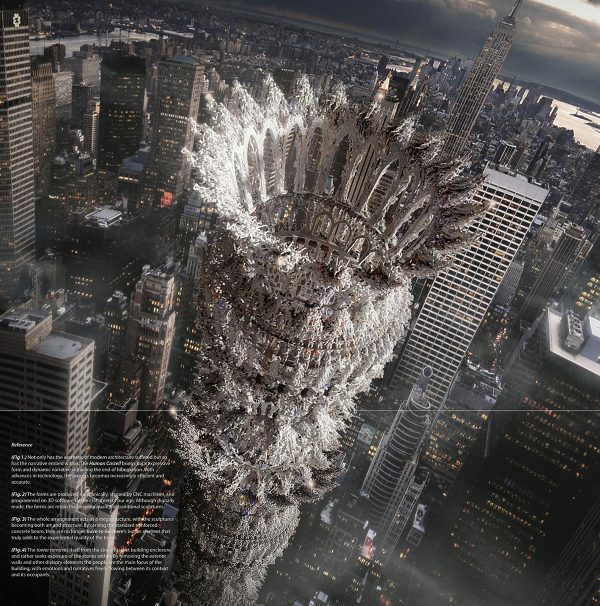 The empty mega form can then be retrofitted to become an extension to the Damascus city fabric for various uses the city may be presented with. The large spaces that were used in converting debris can be adaptively re-used into civic spaces, tertiary institutions, religious sanctuaries, accommodation or new work places. Becoming a usable and reusable typology, allows Syria to revitalize and support its future economy and livelihood. Nowadays, the construction of the building needs a lot of time, manpower, and working procedure. A variety of buildings are formed through being assembled with different materials. However, the changeless rigid material has not been able to meet the people’s pursuit of the architectural form, and the complex construction process also limits the development of the building. So we hope to explore a new architectural model to meet people’s pursuit of architectural form while reducing the tedious construction process. Draping – just like putting on clothes for a building, which are tailor made from inside to outside. We hope to find out a new material which can be arbitrarily folded, cut, enclosed, sewed, turned over, and falls into a pattern. Tower just shows such a concept and form. Most of its exterior spread like vertically carpet from its top floor, the local contraction showing a part of the internal details. In addition, its interior is assembled with more detailed small units. This method not only makes the construction of the building more convenient and simple, makes the building repaired easily, but also makes the material easily reused and recycled after the demolition. Senseless, disconnected blocks crowd the urban scape. The absence of dialogue, of emotional connection, brings up the question: where does art end and architecture begin? Although art and architecture are distinctly different, they share one obvious characteristic: the ability to activate emotional response. In its thousand years of history, architecture spoke of myths and tales through sculptural expression, and tapped into its ability. However, coming into the 20th century’s age of mechanization, the doctrine ‘form follows function’ manifest itself so deeply that now, architecture of raw, honest narrative is hard to be found. The issue at hand in the modern city is not simply the “modern box” aesthetic. The problem is that these structures lack an authentic connection to the ever-changing dialogue in which they exist. To our stories. The human castell, inspired by the castells of ancient Catalonia, continue the story that was abruptly cut off. By bringing back formal expression in full force supported by new technologies, the tower begins to fill in the blank page. Using the pure human form the tower builds upon itself, figure upon figure, each layer telling a story. 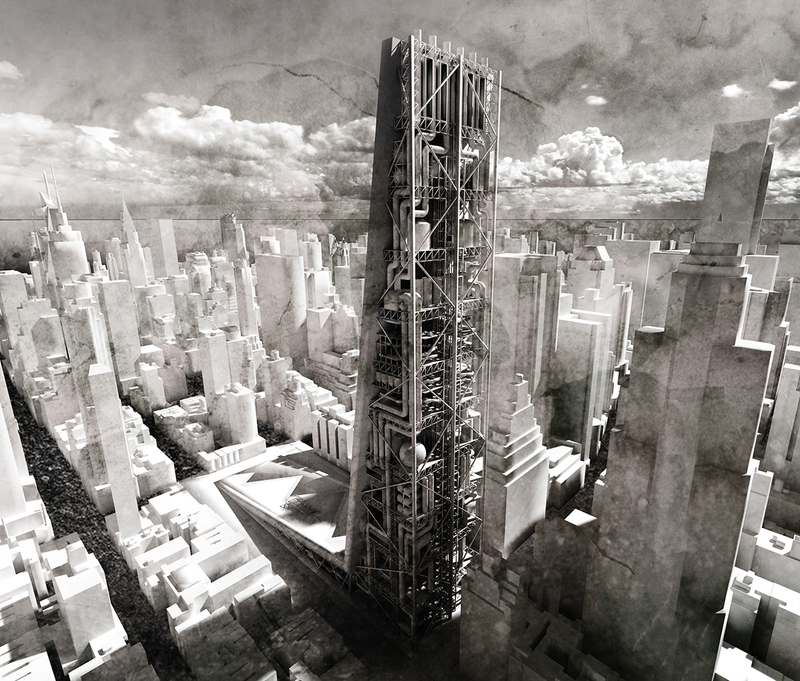 Rid of exterior walls and obstructive barriers the tower opens its insides towards the city. The human castell flips the typical building inside out, bringing out the stories that are hidden within the dark enclosure of buildings. This is enabled by our developing technologies, the forms become the stories but also the structure itself, voiding the need for additional superstructure so no small gesture is lost in translation. It presents a concrete and very solid depiction of our society as it is: the fear, the pain, the joy, and the excitement. Each layer enriching the other to finally become the most raw, unobstructed representation of who we are and what our stories create. At last breathing a much needed sense of identity and emotion into the grey city. From the office windows and cramped apartment blocks high in the city sky we see the human castell, an enchanting yet solid reminder of who we are and the value that lies within this knowledge. When times pass and our stories change, more towers such as the castell rise up, telling the new stories and acknowledging the ones that have brought them where they are now. New York, the densest and largest city in the World, is also widely reported to be the most wasteful in terms of garbage, water use and energy. It generates 14 million tonnes of waste each year and spends $2.3 billion per year disposing it off. Until 2001 nearly all of NYC waste ended up in landfill in the borough of Staten Island. Since its closure the garbage is transported to landfills elsewhere. This approach is only diverting the problem and fails to recognize that the reason for excessive amount of waste is not only the sheer size of the city but is mostly a result of consumer-throwaway culture. The magnitude of this manifestation of wastefulness is amplified with the density. Manhattan, the densest county in America, generates 2400 tonnes of waste alone every day. There is a constant flow of products into the busy city centre and at the same time a flow of waste going out. This waste is scarcely recycled due to lack of public recycling facilities and either ends up in landfill or if recycled, the raw material, goes as far as China to be used in manufacture again. This results in pollution due to transport. This consumerism and wastefulness cycle continues on a global scale. Urban Mining Factory is a vertical recycling factory in the heart of the city. A factory which turns trash to product. Process is focused on the materials and waste of the city such as paper, plastic or food and turning those into products and fuel that the city needs. The essence of the project is to create closed loop cycle for as many materials-products as possible. The tower focuses on the things that city is using the most. Building celebrates the process of reclaiming materials, manufacturing and then selling the products. New York’s problem with waste could be solved by recycling but foremostly by waste reduction. Positioning a recycling tower in the middle of Manhattan would not only promote recycling, educate people of New York about its importance and make them aware what happens to all their waste, but also cut down the cost and emissions of diesel burned to transport garbage out of the city to landfill and also transport the products into the city. By its exoskeletal nature with exposed services and processes to the outside, the building serves as a noble impulse to the modern World. Its form is derived from the process taking place inside, changing from top to bottom, from raw to product. Furthermore, the form is a celebration of the process and it provides visitors an opportunity to experience it. For a long time, ancient Chinese people have unlimited desire for the mysterious sky. Many years ago, China experienced the era of exploring the high-rise building, such as high-platform building, Tasha, and so on, even our ancient emperor Wei also want to build a super high palace. All of the stories show our ancestors’ aspirations and creative ideas for the high-altitude buildings. Cultural inheritance is considered as a significant design element in the development of exploring the high-rise buildings. We should solve the ecological issues by using our science and technological methods and try our best to preserve our historical cultures. Human destroy nature, break and disorder the balance of original ecological system. Our plan try to consider architecture as a special medium to better the relationship among human and nature and recover the balance of ecological system. We use the traditional design forms to solve the environmental problems and preserve the regional cultural context. Analyze and reorganize the functions in multiple ways to create a living complex with the local cultural significance. We try to use Chinese painting comfortable and free expression forms to plan and design architecture to strengthen the contacts between different people, human and nature. Since the industrial revolution, production fuels the capitalism and consumerism, the big cities and skyscrapers become possible. And this was when workers began to play an important role in this complicated social system. Due to the height they need to work at, construction workers are viewed as one of the most dangerous professions now, not to mention in early days when security measures were less efficient. They are risking their life building our cities when architects and city planners seem to take all the credit. Ironically, the construction builders are underpaid, surviving at the bottom of the society. As our cities sprawl over the land, the confrontation between the worker class and upper social classes has become sharper than ever. The luxurious skyscrapers take up the urban space, while the constructers of these buildings end up in city corners or even homeless. They have laid every piece of brick in the city, yet were driven away from the kingdom they built by high prices and other urban problems. Seldom do they have a chance to live a city life. Change will happen. The workers start from a common strike and take up movement. Soon the site of taking up will become a site to live. With scaffolds erected, workers move in, infrastructure built, a community of workers leaded by constructors grows out of the top of our concrete jungle. 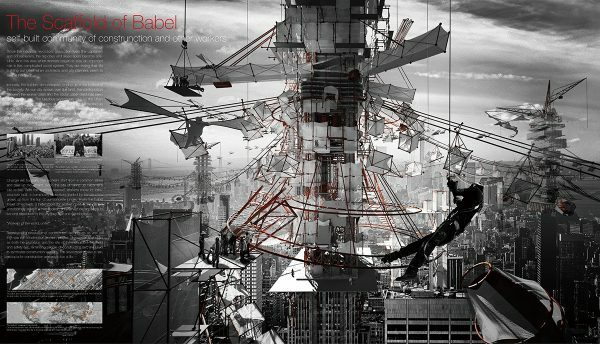 That’s the babel tower of workers, a heterotopia for worker class in the central and topmost area in a metropolitan, a deserved decent place to live and reproduce in the city they have devoted themselves to. 1. Defense. Guarded by soldiers, this is the first step of uprising, ensuring safety of the upcoming new society. 2. Equipment. Taking energy crisis and environmental pollution into consideration, we created space for large machineries to purify water and air and to converse solar power, producing clean energy for the society. 3. Transportation. Several towers would be built in a city successively to meet the need and cable cars would act as public transport among them. 4. Residence & Agriculture. After infrastructure is well-developed, housing would be built for workers moving in. Every resident is provided with a piece of farmland. Confronted with food shortage, residents can grow their own food. 5. Communication. Open space would be built on top of high-density residence for communication. It’s also place for all kinds of outdoor activities. 6. Construction. Construction process can be continued whenever is needed. On top of the tower, this layer is also for sightseeing. From the beginning of time we have shown our eagerness towards progress. “Mutable man may be able to make them (challenges of life within the boundaries of death) – our existence as a species can have genuine meaning and fulfillment. However, vast the darkness, we must supply our own light.” – Kubrick said. The very meaninglessness of life forces a man to create his own meaning. We could understand the history of mankind though this eagerness, from the cave man – to the industrial revolution. The first step should Mars, which is better suited to scale up to host a multi-planetary civilization that any other planet from our solar system. 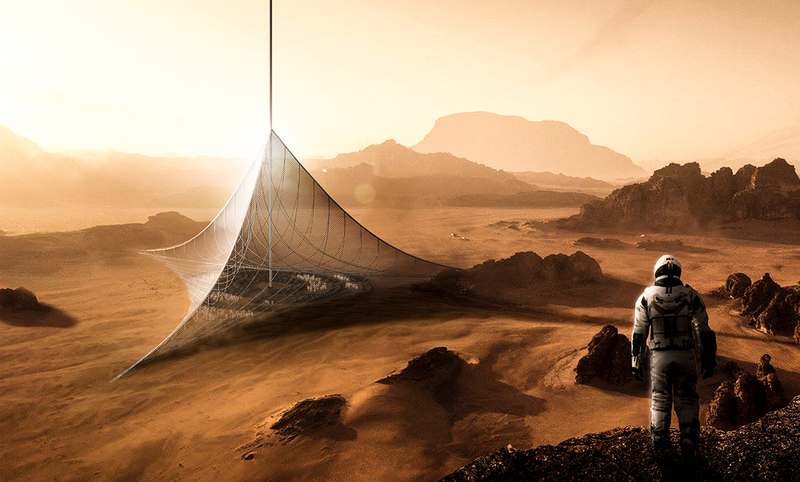 Our mission is to create a habitat that would host the first city on Mars. Our proposal is the axis between the first flights and the terraforming of the planet. A building that would serve as an entrance to Mars. Before terraforming Mars we must think of an access to it. 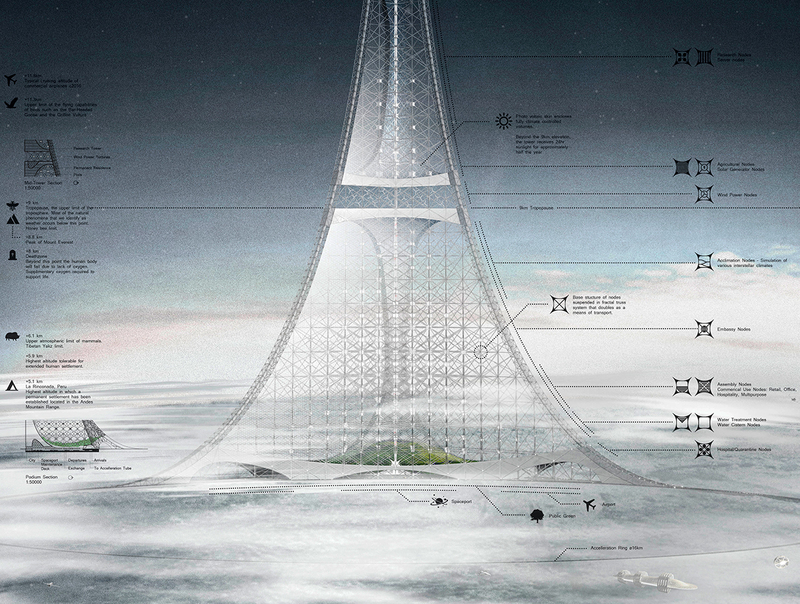 We propose a space elevator that would be composed of four elements. 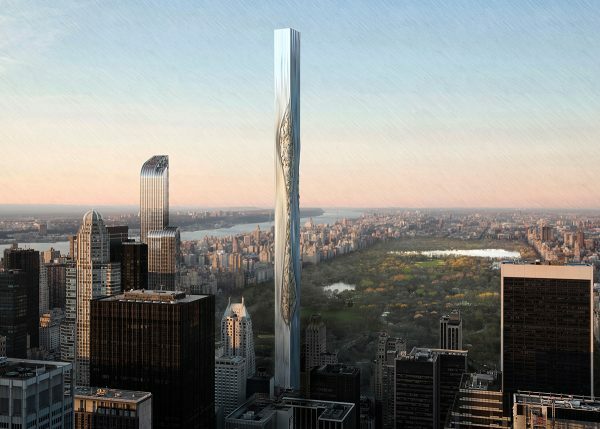 A counterweight to the top, a tent to the bottom, a tube that connects both elements and the elevator itself. The counterweight would be located at a distance to which an object in the orbit moves at the same speed as the rotation of the planet. It would receive the spaceships and host the necessary laboratories in a radial composition. A skin covers the capsules and absorbs the solar energy far from the contamination of the atmosphere. It is a door to the habitat. The tube would connect both the counterweight and the habitat on Mars. It must be strong enough to resist the traction produced by the rotation of the counterweight and wide enough to host the elevator. “You need to live in a dome, initially”. In order to make the planet habitable, we first start by creating a tent inside which life will start for the first time. At first, a small volume of oxygen will be separated from the abundant carbon dioxide in order to make the air breathable inside the tent. The soil would be transformed and vegetation would grow.